Batman has been staring down at me from the mid shelf of my bookcase for a few days now. An unblinking crow, never wavering and ever diligent. I cannot escape his gaze. I try to pretend otherwise but I know what, or rather, WHO he’s looking for.. watching for. It’s my fault really. I was the one who let him out of his cage. 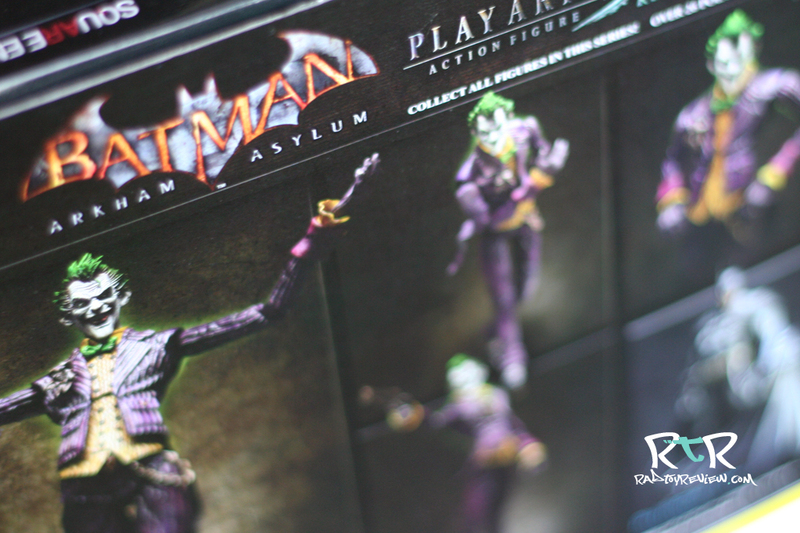 The cardboard and plastic semblance of Arkham Asylum. Only held together by a few pieces of scotch tape and a prayer. Yet enough for a time. He arrived to me out of necessity more than luxury. I take some solace in the idea that Batman must know this. It’s said that to have good you must have evil. To see the darkness, you must know the light. To understand true joy you must experience personal tragedy. 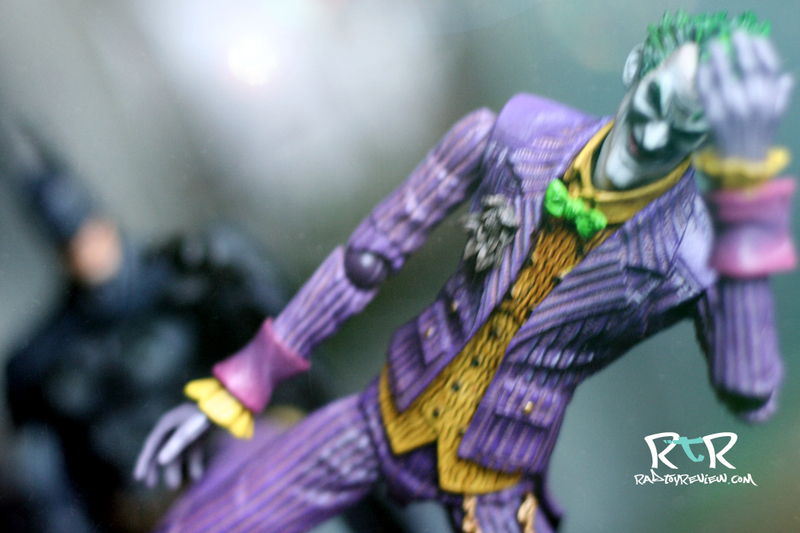 To have Batman, you must have..
Joker’s plastic prison was much the same as Batman’s, only a good deal thinner. I found it a tad ironic that Joker’s box probably killed at least one less tree than Batman’s. If you read our Batman review you have a good idea of what to expect this time around. All in all it’s about the same sequins-decked ballroom gown minus a few inches at the waist. 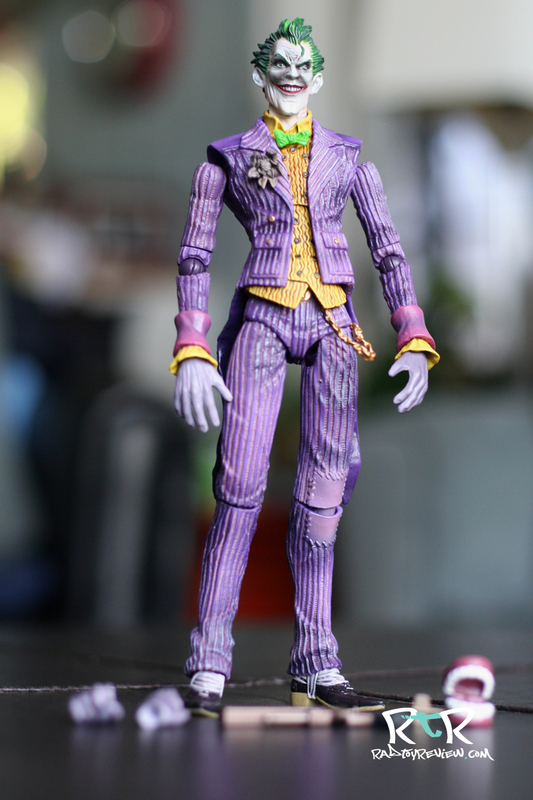 You cut a thin piece of tape at the top tab and Joker slides out in a plastic tray sans fuss. Marvelous! 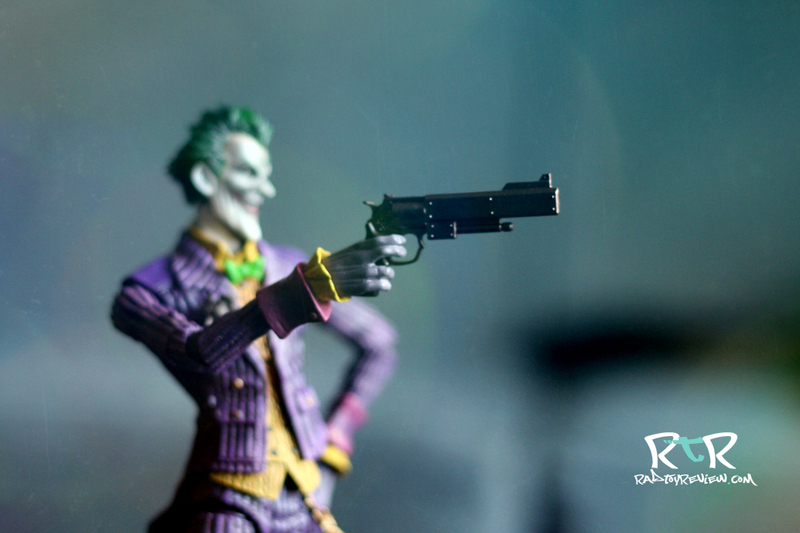 As much as I would have enjoyed seeing it, Joker did NOT include a 3 foot long gun with a “BANG” flag hanging out of the end of it. From another era I suppose. 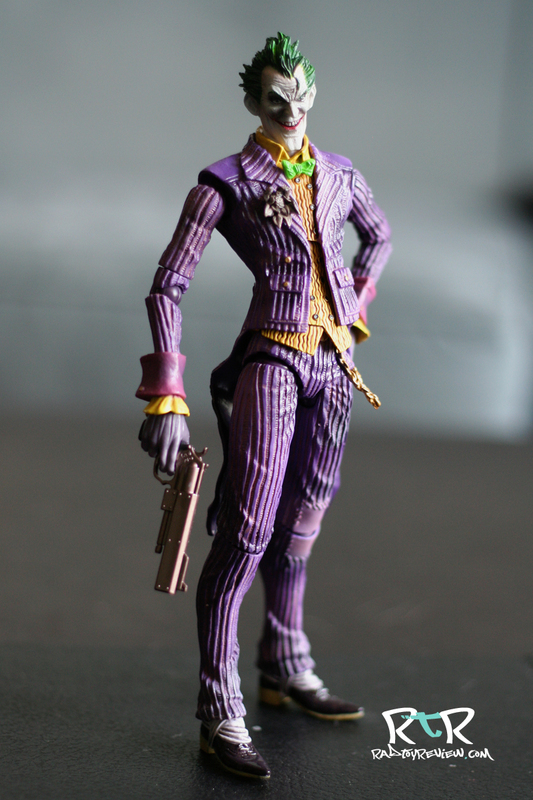 Instead, Joker comes with a hand canon that’d possibly make Robocop jealous. 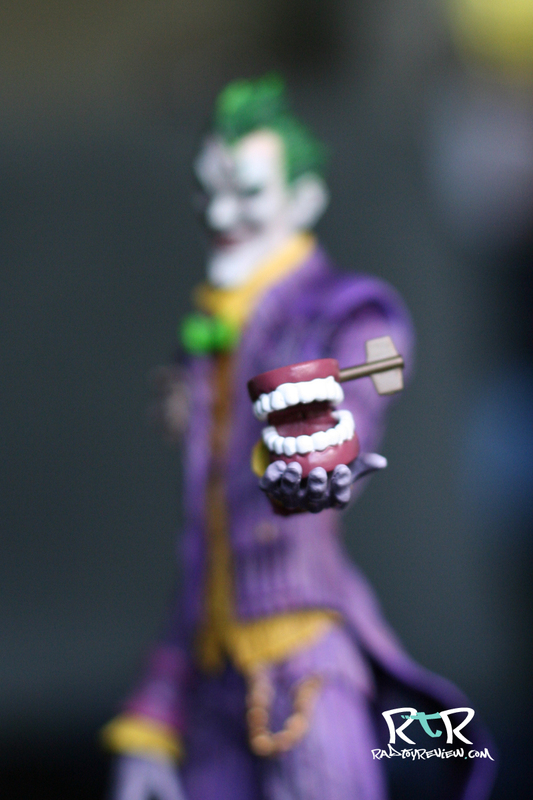 He also comes with comically delightful wind-up chomping teeth that you can open and close.. though cannot wind-up. Like Batman, he too comes with an extra pair of hands to hold his gadgets and gift you with a wider array of pose options. 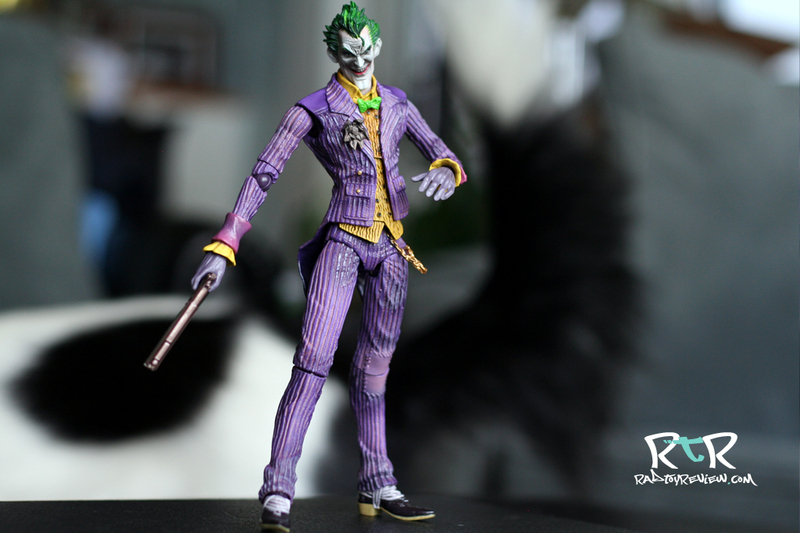 Out of the pack, Joker looks absolutely fantastic! 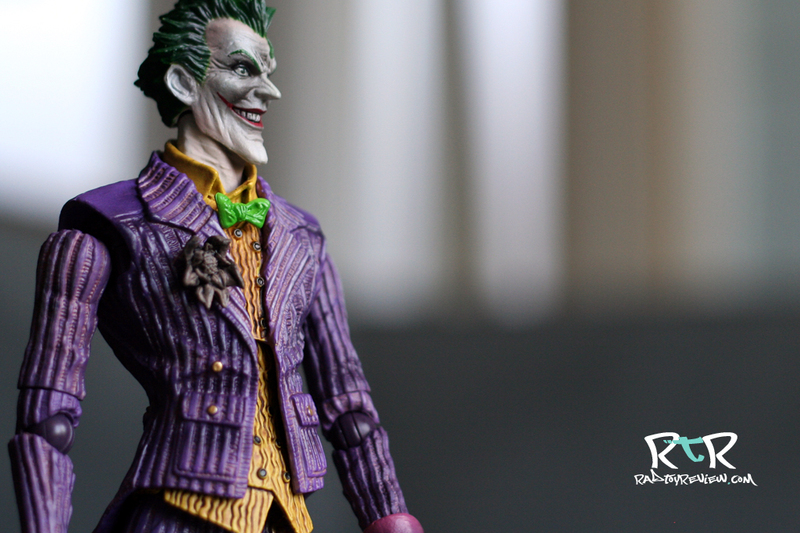 The pin stripe on his dapper attire is sculpted in, his evil/mischievous grin spot on and check out his shoes! His strapped shoes must have cost him a small fortune at the “clothes you can’t buy in this century” shop. They’re shiny too. I love ’em! 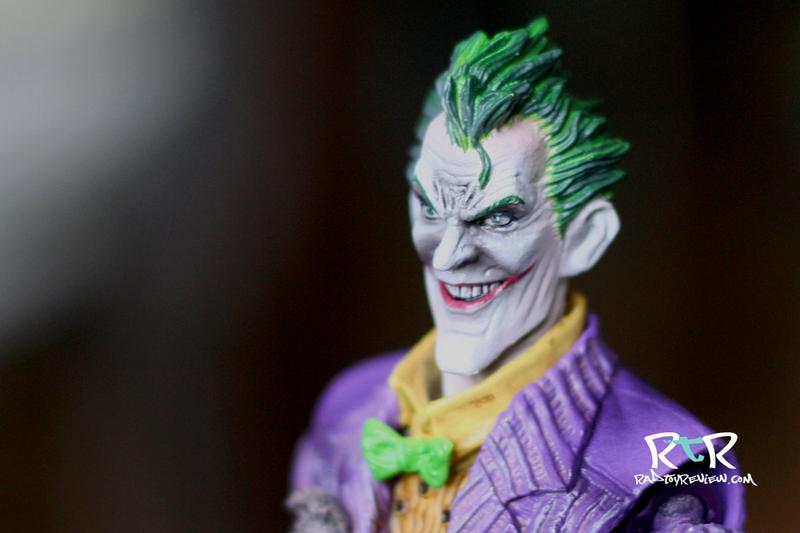 Joker’s visage is right in line with the villain whose eye you dotted in Arkham Asylum. 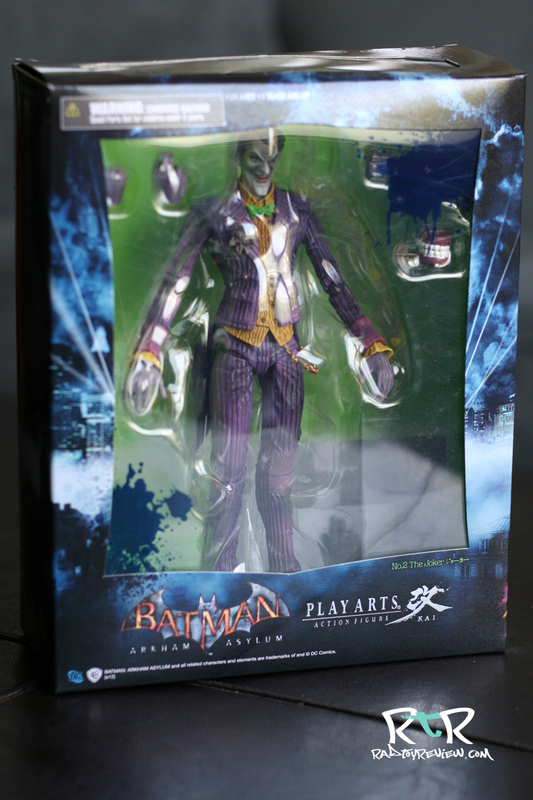 As with Batman, Play Arts Kai obviously took care to accurately capture the game version of the character right down to the pointy chin. He looks great. 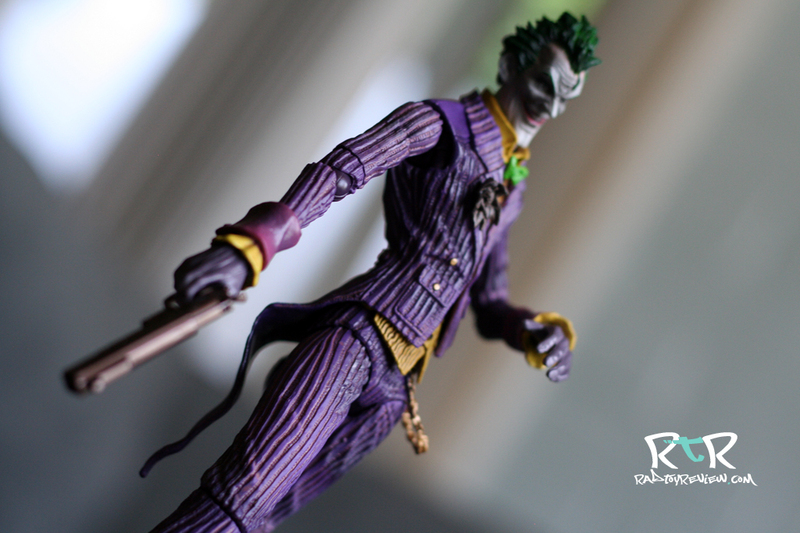 As much as I truly love how the Joker looks, I’d be wrong not to mention the incredibly apparent shoulder joints. Unlike Batman, whose cape does well to hide whatever shenanigans his shoulders are getting into, Joker’s shoulders are giant seams bordering on holes. With some modest finessing you can somewhat hide them, but in almost any pose you put him in they’ll be readily apparent. This will bother some more than others. 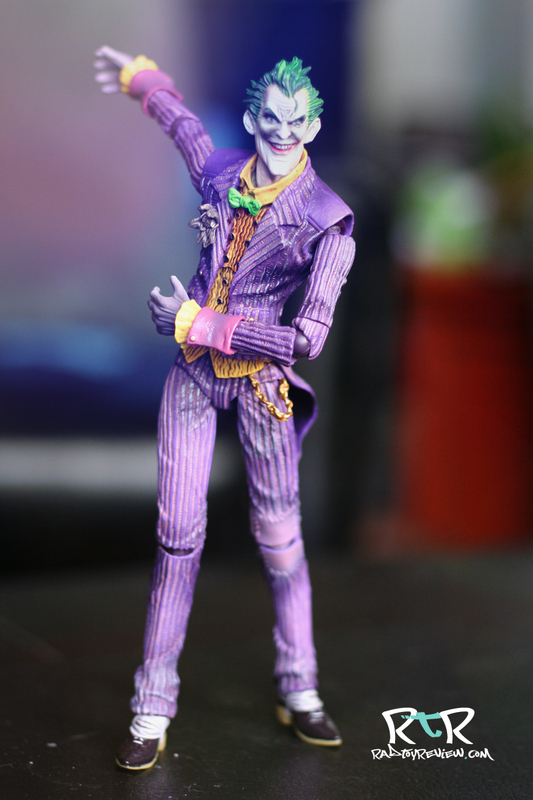 Let me repeat the stuff I said earlier about Joker looking great. There are so many great things here in the sculpt, the paint application, the little details like the dead flower pinned to his lapel and the gold chain hanging from his pocket. The purple suit he’s sporting even has tails. TAILS, MAN! With so much praise feeding into this garden, what possible detractors could I rummage up ? Well, honestly? Or at least as fun as you’d like him to be. That might sound a little harsh, but I assure you that I’d like nothing more than to claim otherwise. I feel like I managed to pull off some pretty tight and dramatic poses with Joker but it was a downright chore to do so. 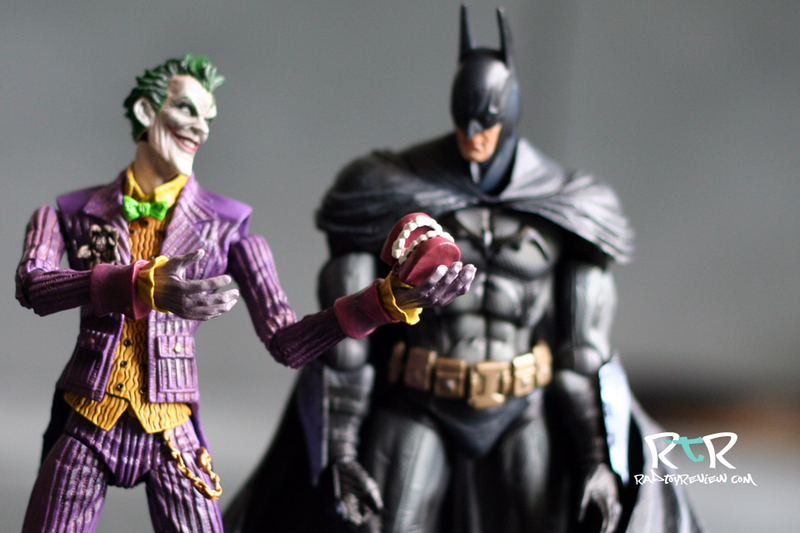 The first thing I do when writing and photographing a toy for review is stand the figure up in a neutral pose. Turns out, Joker does not easily come to terms with this idea. He’s a bit of a chore to get standing up on his own. 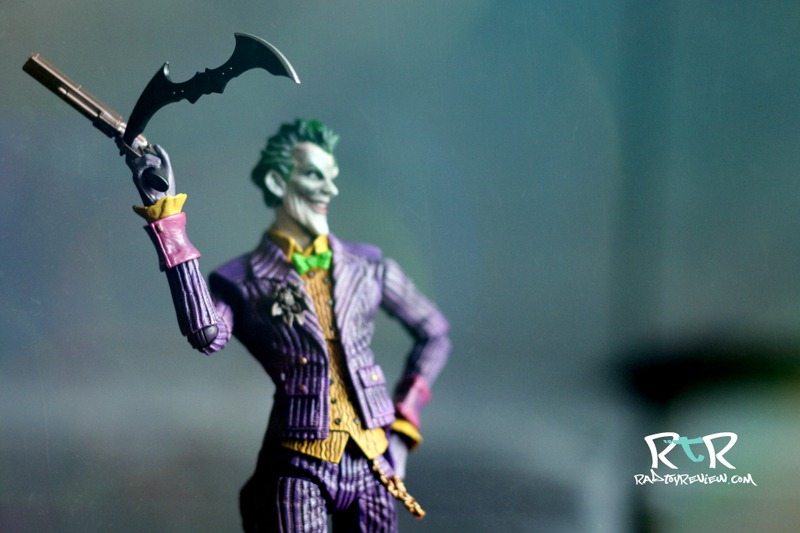 While Bats has the advantage of his long pointy cape to give him an extra dash of “prop,” Joker is free ball’n. His feet are so slender, his legs sculpted into a natural bend that’s so extreme, that possibly even more so than Batman, gravity is his worst enemy. Obviously, I eventually did get him standing. The thing is, I don’t necessarily consider the difficultly in balancing him that massive an issue. I take it as a challenge like one might when balancing an egg filled spoon in one’s mouth and carrying it across a beer stained dorm room. Heck, some collectors only display their figures with stands, sometimes showcased in dramatic “Crouching Tiger, Hidden Dragon” sort of dioramas only possibly with one. That being said, lack of balance is certainly not a perk either. What gets me is a combination of issues. The real issue I found lies with his aforementioned tiny shoulder joints. Beyond being very obvious and sorta screwing up the otherwise killer aesthetic of the Joker, they don’t hold up to play very well either. 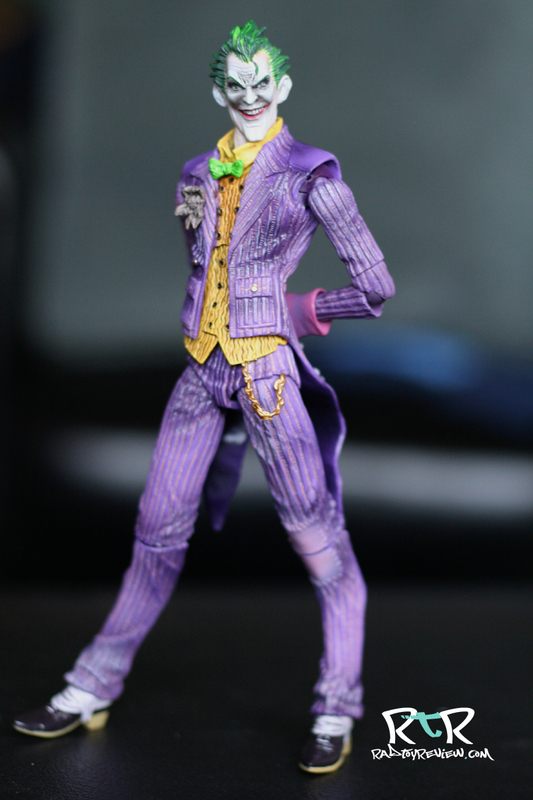 A conservative estimate of 7 out of 10 poses I attempted to put Joker into saw one or both of his arms popping out of joint. I’d just get him balanced, standing upright like a proper homo sapien should, only to fumble while fine-tuning his arms and they’d come right off. The only recourse was to pick him up, pop his arms back into the joint and start over again. Maybe Batman cheated. Maybe the added advantage of his cape giving him balance as well as hiding the unsightly shoulder joint, possibly even assisting in keeping the joint in place, has white washed my view of what this toy should be! But I can’t erase the past. All I know is what I’ve experienced and what I’ve experienced was that I had a blast posing up and playing with Batman, shoulder rotation limitations and all. 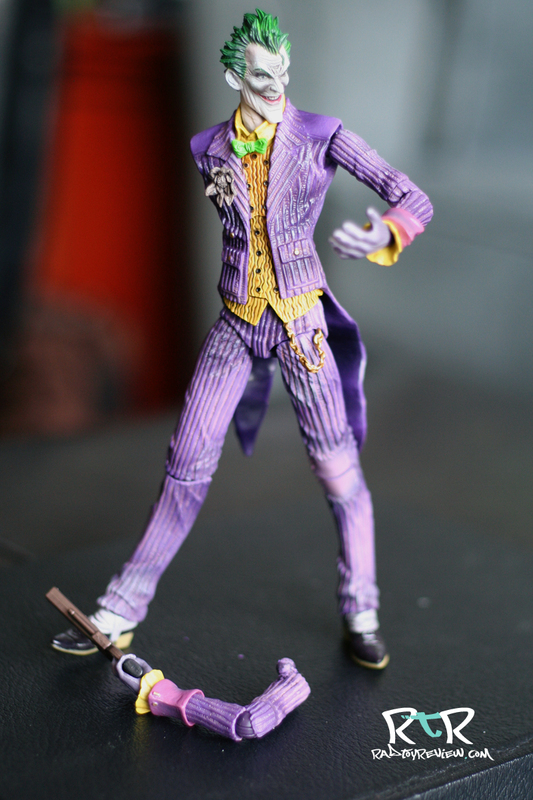 On the other hand, I felt like I was trying to balance two fragile finicky toothpicks while messing with the Joker. 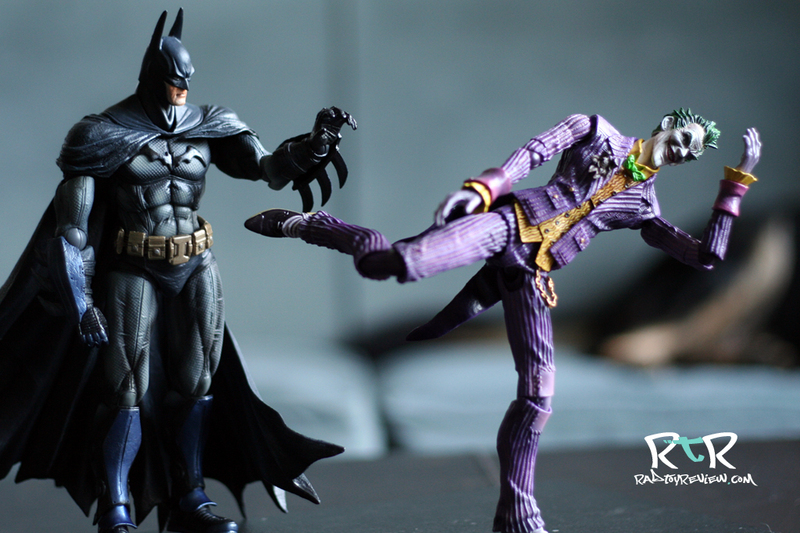 Despite this, with some work you can get Joker to hold some pretty impressive poses. The arcs of his sculpt really look great when they successfully hold ground. I even managed to get him to balance on one leg. 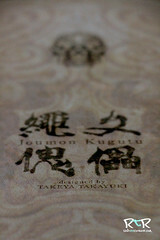 If there is one thing Play Arts Kai did absolutely right with this toy, it’s infuse in it a dramatic sense of movement. I wanted to love this toy. 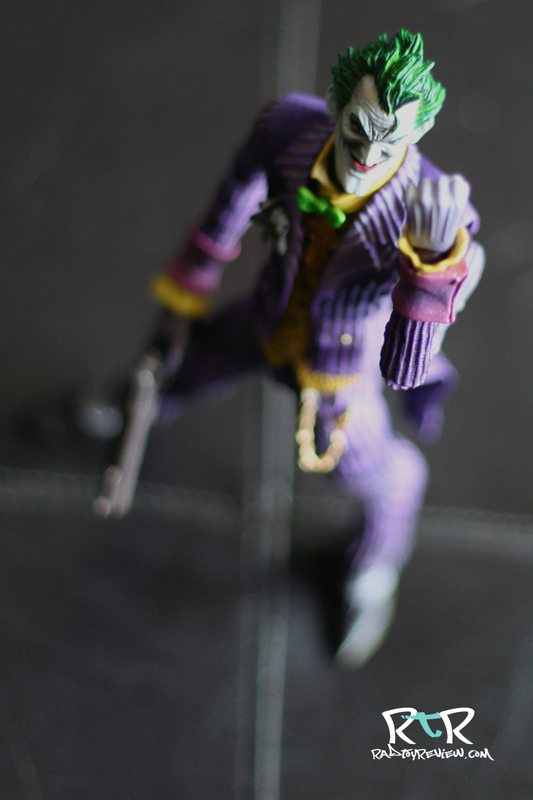 The Joker has been my favorite comic book villain since I was a wee boy. 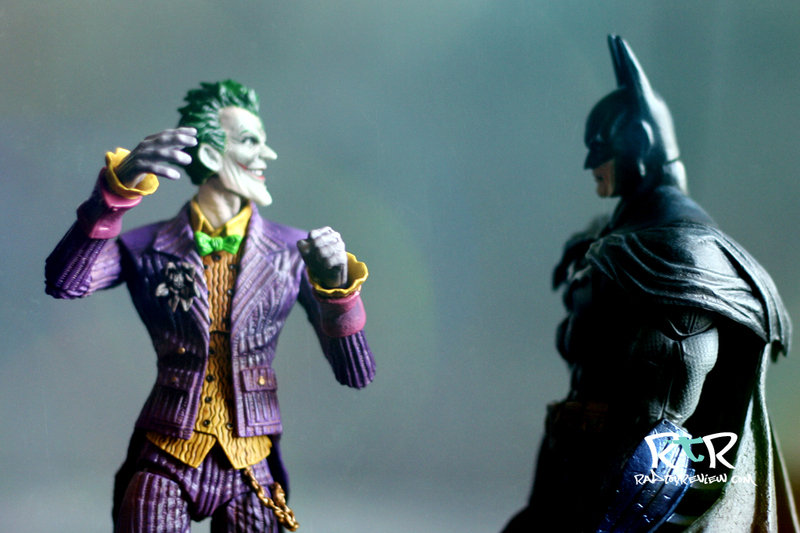 To this day, my ears perk up when I hear about a new Batman or Joker action figure coming around. 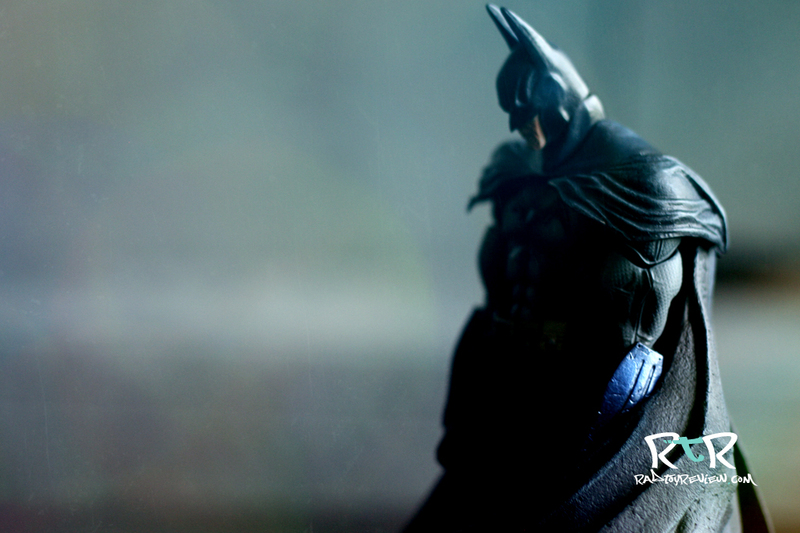 Batman was my very first Play Arts Kai toy and I’m really happy to have him in my collection. Sure, he had a few things I’d like to see improved upon, but I had a lot of fun playing with him. With Joker I had a ton of expectations and a few body blows of reality once in hand. 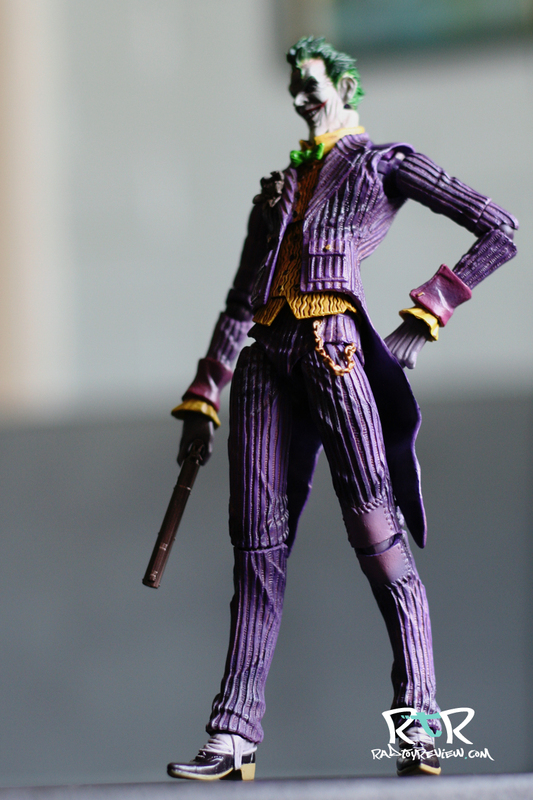 Maybe my Joker is the exception and yours won’t have the same finicky shoulder joints that pop out every five seconds. 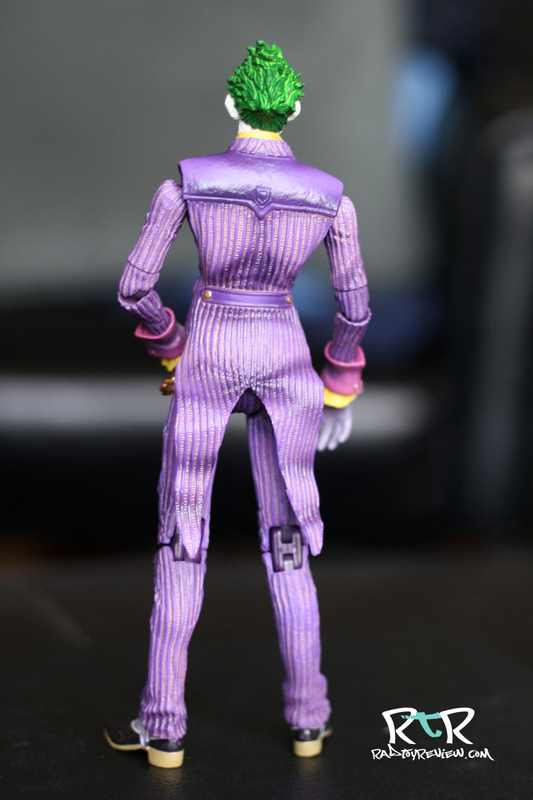 I think he looks great, even with the very exposed shoulder joints that kind of jack up his silhouette. As a colleague of mine once said, “I’m not trying to pretend my toys aren’t toys.” What it really boils down to is the functionality and whether or not it detracts from the overall enjoyment of the toy to you. All that being said, I still hold to the idea that you can’t have one without the other. What are you going to do, just buy Batman? Think about how lonely he’ll be. It’s natural to have both. 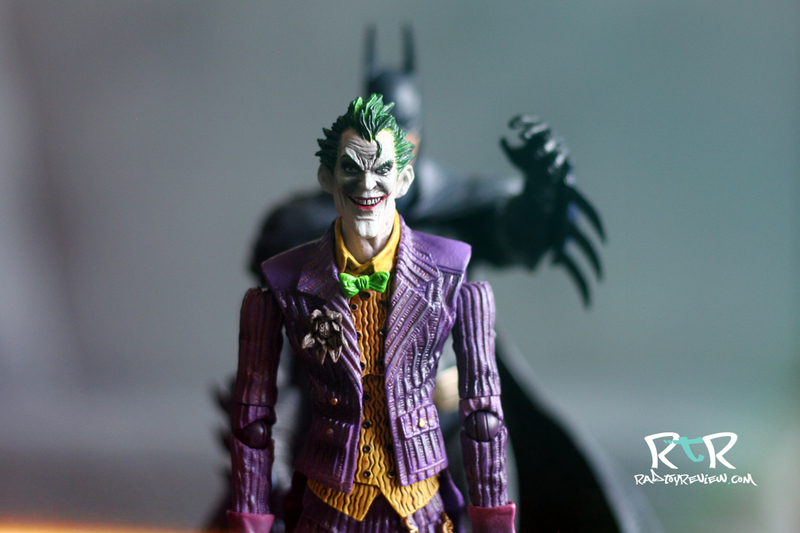 If you have Bats, you darn well NEED Joker. They’re the Yin and Yang/peanut butter and jelly/mashed potatoes and gravy of my collection. And no one eats mashed potatoes without gravy. Fact. I eat mashed potatoes without gravy. 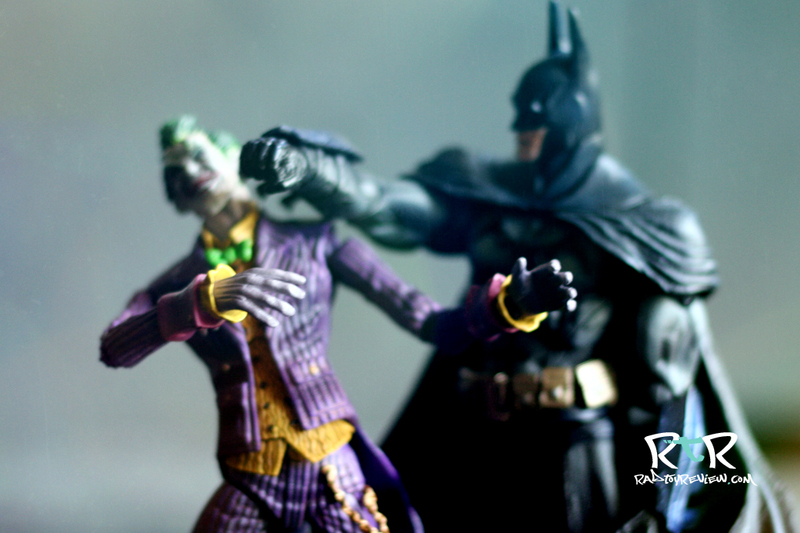 But I’d never have a Batman with no Joker! I know I’m late with this but I had the same problem with the shoulders. What I did was i bought the crazy glue, but the one with the brush tip, and applied the thinest layer possible to the ball on the arm. Left it to dry for a day, and hen made sure it was dry the next day, and popped it back on. Instanty tighter. Hope this helps!